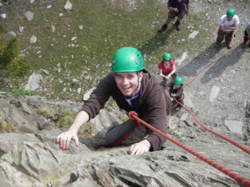 Adventure21 - Climb and abseil risk assessmentRisk assessment in the Lake District, Manchester and Lancashire uk. Risk involved - walking on uneven ground. Lose rocks. Activity done at height with other group members below. Hazards arising from risk - tripping, slipping and falling. Danger of dislodgement of rocks from the top of the climb/abseil onto the group below. Effects of hazard - cuts, bruises, broken bones. Head, neck or spinal injury leading in severe cases to death. Risk management - pre session instruction from qualified person, check of equipment and safety equipment worn throughout the session.